Lewisham Deptford CLP’s AGM has been postponed in order to allow its biggest branch to rerun its delegates election. However, the Regional Director has also been asked to audit the 2017 affiliations to ensure that these confirm to Labour’s rules. 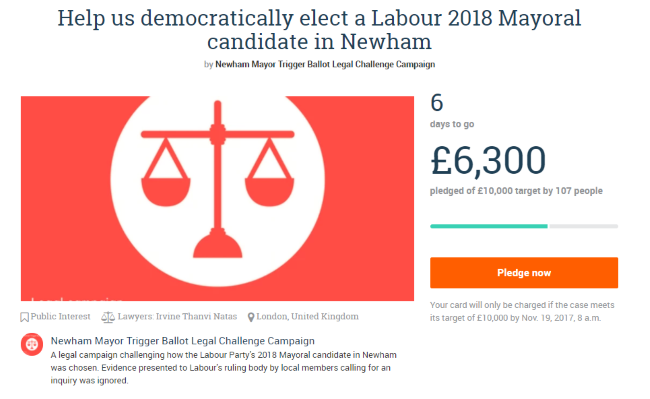 The outrage I feel and the solidarity expressed by comrades in Newham has led me to support their crowd justice campaign to undertake a judicial challenge to the Newham Mayoral trigger ballot. ; their complaints are about questionable exclusions and bogus affiliations. The image above is hyperlinked to the appeal.I suppose I should add that they’d better get a move on as the election campaign starts in the New Year.